The week started with a band concert at Prior Lake High School. The music was quite uplifting. Luke intensely played various percussion parts. I always enjoy hearing him bang his drums. On Friday night, Krazy Kory and Ron "Sugarman" Myers came up to spend the weekend with me. We had lots of fun. We had a good time at the casino and dinner at the Meadows sports bar downstairs. Mmmm. Sweet Potato Fries. No matter how well I think we're getting along, though, somehow things always get out of control and we find ourselves at midnight out on the middle of frozen Prior Lake having fistfights. We woke up bright and early and went to Charlie's on Prior before heading out to the slopes. They have a great breakfast menu. It's been a few years since we've actually made it to the resort and we found things have changed quite a bit at Afton Alps since they were acquired by Vail. Not shocking, but the prices have jumped up quite a bit and the facilities have been upgraded. They also use wireless card readers to go on the ski lifts now instead of just wearing a tag on the outside of your coat. We're being tracked everywhere we go! It took us awhile to get back in the groove of skiing since we're all a lot older since the last time we went and are probably quite a bit more fragile as well. The three of us got off a chairlift together and I ended up wiping both of them out so we all fell to the ground and the chairlift operator had to stop the lift until we could recover. I'm still feeling the pain from that one right in my coccyx! I don't remember ever seeing this reservoir at Afton Alps before, but maybe it's always been there. This is what they use to make snow when Mother Nature isn't cooperating. I'm guessing it's not great for fishing though. After several hours of skiing, we went back to our hotel and then headed over to the Mall of America to see what kind of fun we could find. It's always fun at Benihana! We had a good meal and then hung out at the mall for awhile. All in all, it was a pretty darned good weekend! I had a week's worth of flashbacks to my 14 years working at Nor-Tech as I had multiple encounters with my old co-workers. On Wednesday night, several of us connected for our Fantasy Football Awards Ceremony hosted by our wonderful commissioner Steve "Cuds" Cuddihy. I had another horrible year in fantasy football so my personal awards weren't very lucrative, but getting to share time with these fantastic people is it's own award. On Thursday night we headed into St. Paul to watch the Minnesota Wild host the Arizona Coyotes in an NHL match-up. The Minnesota Wild are one of the hottest teams in the league sporting a record of 30-10 at this point in the season. This was the first time this year we were able to make it to a game and were not disappointed. The Wild won the game 4 goals to 3. It was incredible! This is Joelle from Wishes & More and she was our hostess for the evening. Thanks, Joelle and Carol from Wishes & More for the great time!! I was pretty excited when we walked to our seats and bumped into Wally The Beer Man. I hadn't seen him at a game in quite some time so I thought he may have retired, but nope. He's still the most popular beer man in the business. Although I don't know how he's able to sell anything with so many people stopping to get selfies with him. We had awesome seats in the front row of one of the suites. It gave us a great view of all the action on the ice! The team was intensely watching the game waiting for their chance to get in on the action. If I was going against this guy, I'd probably try to shoot it between his legs. But that's just me. We even saw a few fights while we were there. I'm kind of glad the fighting didn't spread throughout the arena because I'm not a real big fan of getting punched in the face like this guy was doing. That hurts. We wandered over between periods to see some of our buddies from Nor-Tech and their wives. They are Wild regulars so we were excited to have the chance to come hang out with them for a bit. They're good people. On Friday night, we stopped by the high school to see how Prior Lake's FRC team, KING TeC, was doing with building their robot. They're about 2 weeks in to the 6 week build season and things are coming along nicely. We are looking forward to seeing the finished product. Avery is the head of programming and he showed me how he could make the prototype bot spin around in circles. I'm not sure how much that will help in the competition, but it looked like he was having fun doing it. 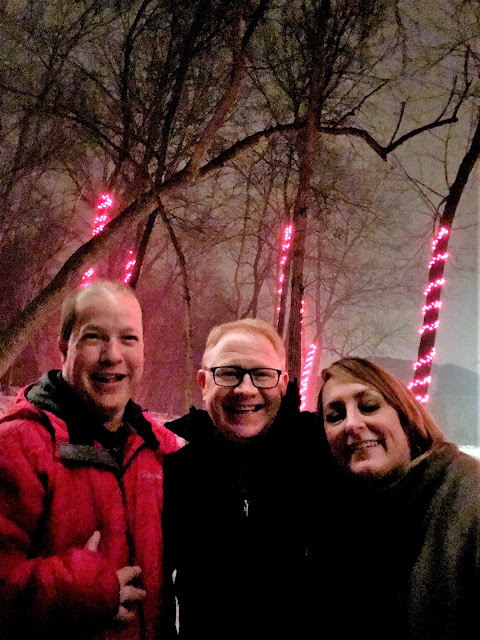 On Saturday night, we hung out with my old boss, Dr. David Bollig, and his lovely wife, Cynthia, who are some of our oldest friends in the twin cities. We had a grand old time catching up on stories and playing pool with one another. Their son, Andy, was home from college and he brought his little friend Hamilton the Hedgehog. I had never been around a hedgehog before but these are incredible little creatures. It's kind of like a fat rat with a porcupine skin and he's not very mobile. He basically lays in your hands or on the ground if you set him there and doesn't do much moving around. Andy explained to me that they are more nocturnal animals and he hears him at night running on his wheel, but becomes very embarrassed if he knows anyone is watching him run. He's a weird little animal, but very cute. We ended the night with a long walk in the woods. David has his whole backyard lit up with Christmas lights so it really stands out when you see it from a distance. We had a bunch of fun with these guys and hope to get together with them again soon. This week we were invited to a Minnesota Wild game by our old friends at Wishes and More so I thought it would be nice if I looked back at the time that Luke Swank performed comedy with the legend, Louie Anderson. Saturday night was a very exciting time for our family as Luke had the opportunity to make his debut as a comedian! If it is true that laughter is the best medicine, then Luke has healing on his side! Diagnosed with heart disease at birth, Luke has been through many surgeries and difficult times. However, overcoming the odds is what he and his twin brother, Avery, also with a heart condition, seem to do best With a comedian father to take after, Luke loves entertaining and being in the spotlight! His great sense of humor and energetic spirit keep him and his loved ones going on what has been a difficult journey. Luke's wish is to be featured on a video as a comedian and tour behind the scenes as a comedian at www.funnyordie.com with producers Will Ferrell, Adam McKay, and Chris Henchy or to meet someone like Adam Sandler. Wishes & More is working hard to get Luke's wish processed so that he and his family can be laughing their way to a wish come true! Not only was Luke performing at the Wishes and More Valentine's Ball, he and Avery were also the official greeters for the event! They did a great job handing out Valentine's to the ladies and shaking hands with the gentlemen as they entered the event. Well, they did a great job at first. After about an hour of greeting the hundreds of people at the entrance, they both got just a little bit cranky! At about 8PM, it was Luke's official debut as a comedian. We were so dang proud of him. Although we'd been practicing the performance for weeks, we were concerned that actually doing it in front of the hundreds of people in the audience would be a challenge for him. But he pulled it off without a single error! He's such a natural. His delivery and timing were right on target and the audience roared with laughter several times. At the end, Luke received a long standing ovation and he beamed with pride!! We tried to get Avery to participate in our act, but he wasn't really into it. The organizers of the evening were very cool, though, and were sure to include Avery in several other parts of the program. Here he's seen demonstrating one of the live auction items and talking to "The Rookie" from Minneapolis talk radio station KSTP AM1500. This is Karla Blomberg. She's the president of Wishes and More and was the one who invited Luke to make his comedy debut at their benefit on Saturday night. After Luke's performance, she stayed with him on stage and told Luke that they'd forwarded the above video of his performance to none other than Louie Anderson! Although we don't have the details yet, she said that Louie has invited Luke to do some kind of comedy bit with him in either Las Vegas or California! Although I'm pretty sure Luke didn't have a clue who Louie Anderson is, mom and dad were very excited to hear it! This is a video of Luke's comedy debut at the Wishes & More Ball. On Saturday night, Luke received his wish from the Wishes and More Organization and had the opportunity to perform on stage with comedy God, Louie Anderson! More details about Luke's wish can be found here. Louie was an extremely nice man and met with our family before the show began. He gave Luke some suggestions on how to do comedy and signed T-Shirts for both of the boys. He even offered us some soda pop before we went back to our seats which we all thought was a very kind gesture! This is Scott Hanson and he's a legend in the Minneapolis Comedy Scene. He owns the Comedy Gallery Comedy Clubs which have been in several locations in the Twin Cities over the years. Many of the biggest names in the business have performed at his clubs. Scott was instrumental in helping Wishes and More to make Luke's wish come true. Luke gave him a Wishes and More hat to say "Thank You" and Scott responded with "I don't think that will fit on my head!" What a funny guy! We didn't have a lot of notice that we were going to be performing, so we did the same routine we did at the Wishes and More Ball in February. We figured it would be easier to practice that one again rather than try to come up with a new act in three days. The crowd seemed pretty receptive to it so I think we made the right call. It's been a long time since I've seen Louie perform. I forgot how funny he is! I don't normally laugh at comedians because I've seen so much stand-up in my life time, but I found myself laughing out loud quite a bit! It was really a great, great night for the Shortarmguy Family!